Deburring Steel Parts - Kramer Industries Inc.
Machined steel parts often need to be deburred. For large quantities of parts, both barrel tumbling and vibratory tumbling can accomplish this task saving labor hours and increasing throughput capacity. The specific details of the process must be chosen carefully to ensure that the parts are not only properly deburred but that the other surface finish specifications are met as well. 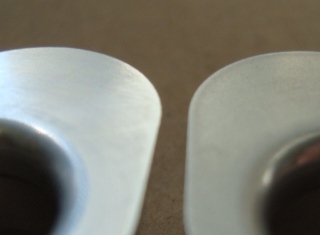 The machined part on the left in this picture has a bright surface and sharp edges. The goal was to deburr the edges with minimal impact on the surface finish. The initial result (part on right) of tumbling with Ceramic Media and a general purpose compound did deburr the part but it also resulted in a dull, matte surface finish. This part will need to be tumbled in second step using a polishing media and a different compound to bring the desired finish back. Having a clear understanding of the ultimate surface finish required and that multiple steps are often needed is the first step in finding the best solution to finishing parts.